Several years ago, Otto worked as a door-to-door sales person for a company in our area. One of the biggest challenges with this job was not meeting the sales quotas but rather to keep from getting bitten by dogs.In fact, one day in less than 30 seconds after a woman told him her dog wouldn’t bite, the dog charged after him at full speed. Had the dog’s owner not grabbed the dog, Otto would have been bitten. Otto was skeptical when the woman told him her dog wouldn’t bite and he was even more skeptical of what she had to say after the dog tried to bite him!It can be that way in our relationships when someone has disappointed us over and over and we’ve lost trust in that person. We just seem to put a question mark in front of everything they say or do. So what do we do if we want to stay in a relationship with this person? How do we learn to trust that person again? One of the keys to rebuilding trust has more to do with what happens after one or both of you apologizes and says “I’m sorry” than the apology itself. We’ve all heard the saying, “Actions speak louder than words” and this is especially true when it comes to rebuilding trust. When there has been an acknowledgment of wrong-doing or if one person has hurt another in some way, there are some things that both people can do to rebuild trust. 1. After the apology, be clear about what actions you would like the other person to take to make amends. 2. If the other person is willing, make an agreement about these actions and how this situation will be handled in the future. 3. Be open to the possibility that no matter how this person’s conduct may have been in the past, this person may change their behavior. Be willing to give up the “victim” position and the desire for making them pay for what they’ve done. In other words, give some positive reinforcement. 1. Understand that a sincere apology is only the first step toward rebuilding trust and your connection with that other person. 2. Ask how you can make amends for what you have done and listen to what the other person is telling you. 3. Be open to the possibility that you can change and get some help if you need to. 4. If you are sincerely willing to change your behavior in the way that the other person suggests, make an agreement to make those changes. 5. Be consistent in your follow through. 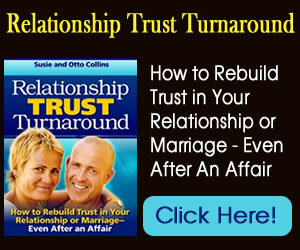 We’ve found that rebuilding trust can take many years or it can happen in an instant. The amount of time that it takes to rebuild trust often depends on how long the people involved are determined to protect and defend their hearts so that they won’t be hurt again. We know that there are many instances where either a person wants to change and just can’t or they have no desire to make the changes that will rebuild trust. They just go through the motions and the excuses and apologies are repeated over and over with no positive actions. If this is what you are experiencing, you have choices to make whether this behavior is important enough for you to take a stand against or not. Remember, that no matter what has happened up until now it’s always important to give love a chance. It’s also important to set healthy boundaries.